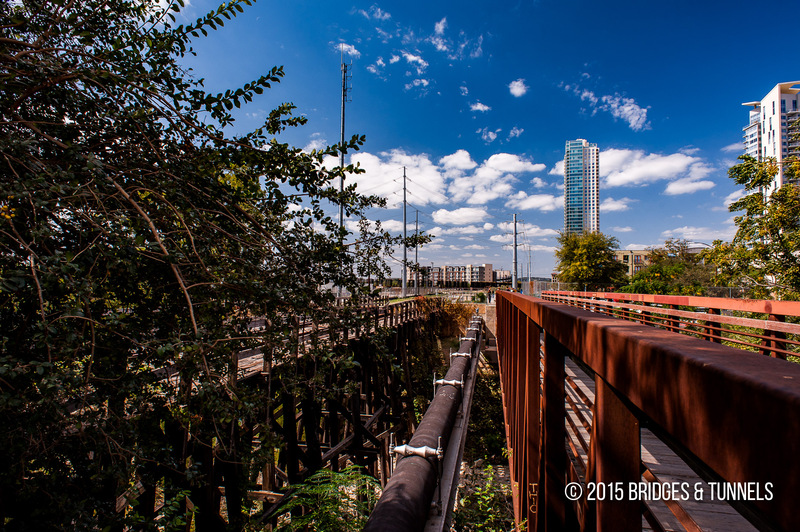 The Katy Railroad trestle and the Lance Armstrong Bikeway cross Shoal Creek in downtown Austin, Texas. 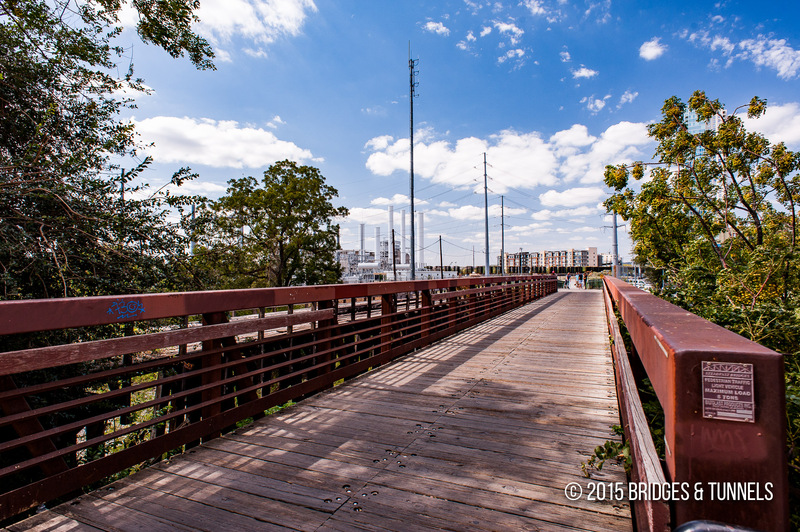 In 1925, the Shoal Creek timber trestle was reconstructed.9 The new bridge featured eleven spans with walkways on the north and south sides of the crossing. In July 1964, the Katy lost a contract to a trucking firm to carry mail for the U.S. Postal Service.2 That resulted in the discontinuation of passenger service, which carried mail, from Dallas to San Antonio. In 1976, the Katy was abandoned from Georgetown south to Pershing at the junction with Austin Western Railroad, and the line through downtown Austin was disused some time after 1988. The Lance Armstrong Bikeway, a major east-west cycling route, was first proposed in 1999 by local cycling advocate Eric Anderson.7 It was recommended by the Urban Transportation Commission, the Planning Commission, the Capital Area Metropolitan Planning Organization and the Environmental Board in July. On October 26, 2000, the city council approved an advanced funding agreement with the Texas Department of Transportation (TxDOT) for the Austin Crosstown Bikeway, and was awarded $3,203,163 in federal funds from the Statewide Transportation Enhancements Program funds. Planning began in December.8 The federal funds provided 62% of the construction cost, with the city paying the remainder. Today, the South 3rd Street Bike Path carries the Lance Armstrong Bikeway. The UP west of the Austin Convention Center to Tower 205 by the Colorado River Bridge has been dismantled, although there are plans to rebuild the line for passenger service.6 The Shoal Creek trestle was rated structurally deficient and is scheduled to be rebuilt with a 44-foot span for two light rail tracks that would also carry two automobile lanes and a pedestrian path. Preliminary engineering plans began in January 2010. “Georgetown to Pershing.” Abandoned Rails. N.p., 2012. Web. 6 Nov. 2012. Article. Greaney, Devin. “Bygone Buildings.” Austin Chronicle. N.p., 26 Jan. 2001. Web. 6 Nov. 2012. Article. “WEST 3RD STREET CREEK CROSSING.” Shoal Creek – Central Library Planning and Design Coordination. Austin: City of Austin, 2010. 28-30. Web. 6 Nov. 2012. Report. Mottola, Daniel. “Lance Armstrong Bikeway Finally Under Way.” Austin Chronicle. N.p., 15 Jun. 2007. Web. 6 Nov. 2012. Article. Austin City Council Agenda: February 15, 2007. N.p. : City of Austin, Texas, 2007. City of Austin. Web. 6 Nov. 2012.Article. Section 106: Identification of Historic Properties. Research rept. N.p. : Texas Department of Transportation, 2000. University of Texas. Web. 6 Nov. 2012. Article.